Progressive metal (whiles kent as prog metal or prog-metal) is a subgenre o hivy metal oreeginatin in the Unitit Kinrick an North Americae in the late 1980s. Progressive metal blendit elements o hivy metal an progressive rock, takin the loud "aggression", amplifeed electric guitar-driven soond o the umwhile, wi the mair experimental, complex an "pseudo-classical" compositions o the latter. Progressive metal aften kept the conceptual themes associatit wi progressive rock. Throughoot the years, progressive metal haes borraed influences frae several ither genres, includin classical an jazz fusion muisic. Whilst the genre emerged towards the late-1980s, it wis no till the 1990s that progressive metal achievit some commercial success. Dream Theater, Queensrÿche an Fates Warning are examples o progressive metal baunds who achievit a degree o popularity an success; additionally, hivy metal baunds sic as Metallica incorporatit elements o progressive muisic in thair wirk. The mixin o the progressive rock an hivy metal styles can be tracit back tae the late 1960s an early 1970s. Ane o Ingland's hiviest progressive rock baunds, High Tide, fused the elements o "metal progenitors such as Cream, Blue Cheer, an the Jeff Beck Group" intae thair soond. Ither baunds sic as King Crimson an Rush wur an aw incorporatin metal intae thair muisic, as well as Uriah Heep, whose "bi-the-beuks progressive hivy metal made the Breetish baund ane o the maist popular hard rock groups o the early '70s". Rush sangs sic as "Bastille Day", "Anthem", "By-Tor an Snow Dog", "2112", "The Fountain of Lamneth" an "Something for Nothing" hae been citit as some o the earliest examples o progressive metal. Anither early practitioner o progressive rock an hivy metal wur Lucifer's Friend. Night Sun wis an aw an early baund who mixed hivy metal wi progressive rock tones, tho anerlie releasin ane album. Housomeivver, progressive metal did no develop intae a genre o its awn till the mid-1980s. Baunds sic as Psychotic Waltz, Fates Warning, Queensrÿche, an Dream Theater teuk elements o progressive rock groups (primarily the instrumentation an compositional structur o sangs) an mergit them wi hivy metal styles associatit wi baunds lik Judas Priest an Black Sabbath (the umwhile o which haed some progressive influences on thair early albums). The result coud be describit as a progressive rock mentality wi hivy metal soonds. Thir three early flagship baunds for progressive metal (Fates Warning, Queensrÿche, an Dream Theater) each haed somewha different soonds. Queensrÿche haed the maist melodic soond o the three an achievit, wi Operation Mindcrime and Empire the genre's maist immediate commercial successes, which peaked wi the crossover single "Silent Lucidity" reachin nummer nine on the Billboard Hot 100. Dream Theater drew mair heavily upon traditional progressive rock and an aa biggit much of thair earlier career on the baund members' virtuoso instrumental skills, despite an aa achieving an early - and unexpected - MTV hit wi the aicht-minute "Pull Me Under" frae 1992's Images and Words. Fates Warning wur the maist aggressive an hivy an arguably haed the maist in common wi the thrash an extreme metal scenes o the time, which led them tae be the least accessible o the three baunds. Tho progressive metal wis, an haes remained, primarily an album-orientit genre, this mainstream exposur increased the genre's profile, an opened doors for ither baunds. Ower the 1990s, baunds sic as Pain of Salvation, Vanden Plas, Threshold, Symphony X, Tool, Andromeda, Porcupine Tree an Arjen Anthony Lucassen's Ayreon project aw succeedit in developin thair awn audiences an signatur soonds. In the decade which follaed, airtists who began thair careers ootside o the progressive milieu, sic as Swaden's Tiamat (oreeginally a daith/doom metal act), Green Carnation an Opeth (baith formit in the daith metal moud), developit a progressive soond an became identifeed wi the progressive metal genre. Ayreon stayed wi the traditional prog metal themes, but mixed them wi mony ither influences, prominently rock opera an ambient. Symphony X marriet progressive elements tae pouer metal an classical muisic. 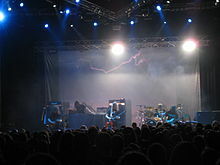 Tool creatit a progressive soond uisin alternative metal elements an odd rhythms. Steve Vai's umwhile sangster an hivy metal baund Strapping Young Lad's sangster an guitarist Devin Townsend combined elements o post-metal an ambient wi traditional progressive metal on his first twa solo albums Ocean Machine: Biomech an Infinity. Mastodon an aw combined progressive metal wi sludge elements. Opeth, Skyfire, an Between the Buried and Me combined (in vera different ways) thair prog influence wi daith metal. Baunds sic as 30 Seconds to Mars creatit a mair traditional progressive soond that incorporatit elements o space rock. Progressive metal can be braken doun intae coontless sub-genres correspondin tae certaint ither styles o muisic that hae influencit progressive metal groups. For example, twa bands that are commonly identifeed as progressive metal, King's X an Opeth, are at opposite ends o the sonic spectrum tae ane anither. King's X are greatly influencit bi softer mainstream rock an, in fact, contributit tae the growthe o grunge, influencin baunds lik Pearl Jam, whose bassist Jeff Ament ance said, "King's X inventit grunge.". Opeth's groulin vocals an hivy guitars (leeberally intermixed wi gothic metal-evocative acoustic passages an clean melodic vocals) aften see them citit as progressive daith metal, yet thair vocalist [[Mikael Åkerfeldt ]] refers tae Yes an Camel as major influences in the style o thair muisic. Classical an symphonic muisic hae an aw haed a significant impact on sections o the progressive metal genre, wi airtists lik Devin Townsend, Symphony X, Sleepy Hollow an Shadow Gallery fusin traditional progressive metal wi a complexity an grandeur uisually foond in classical compositions. Similarly, baunds sic as Dream Theater, Planet X an Liquid Tension Experiment hae a jazz influence, wi extendit solo sections that aften featur "tradin solos". Cynic, Atheist, Opeth, Pestilence, Between the Buried and Me an Meshuggah aw blendit jazz/fusion wi daith metal, but in dramatically different ways. Devin Townsend draws on mair Ambient influences in the atmosphere o his muisic. Progressive metal is an aw aften linkit wi pouer metal, hence the ProgPower muisic festival, wi baunds sic as Fates Warning an Conception oreeginatin as pouer metal baunds that incorporatit progressive elements which came tae owershadow thair pouer metal ruits. Progressive metal haes an aw owerlappit thrash metal - maist famously perhaps wi Dark Angel's swansang album Time Does Not Heal, which wis famous for its sticker that said "9 sangs, 67 minutes, 246 riffs." The baund Watchtower, who released thair first album in 1985, blendit the modren thrash metal soond wi hivy progressive influences, an even Megadeth wur aften and still are aften associatit wi progressive metal, as Dave Mustaine even ance claimit that the baund wis billed as "jazz metal" in the early '80s. The baund Racer X wad an aw faw athin this genre o technical proficiency featurin Paul Gilbert, a guitar instructor at the Musicians Institute in LA, a tendency evidencit on sangs sic as "B.R.O." frae 1999's Technical Difficulties. The baund Voivod an aw combinit elements o thrash metal an progressive metal, specifically on the releases Dimension Hatross an Nothingface, in 1988 an 1989 respectively. Recently, wi a new wave o popularity in shred guitar, the hitherto-unfashionable genre o "technical metal" haes acome increasingly prevalent an popular in the metal scene. This haes led tae a resurgence o popularity for mair traditional progressive metal baunds lik Dream Theater an Symphony X, an an aw haes led tae the inclusion athin the progressive metal scene o baunds that dae no necessarily play in its traditional style sic as thrash/pouer metallers Nevermore, an the technical daith metal act Necrophagist. Thir baunds are, richtly or wrangly, aften labeled progressive metal, as thay dae play relatively complex an technical metal muisic which daes no readily cleave tae ony ither metal subgenre. Awtho progressive metal an avant-garde metal baith favor experimentation an non-staundart ideas, thare are rather lairge differences atween the twa genres. The experimentation o progressive metal haes a strang emphasis on technicality an theoretical complexity (influencit bi jazz muisic). This is done bi playin complex rhythms an implementin unuisual time signaturs an sang structures - aw wi the uise o traditional instruments. For avant-garde metal, maist o the experimentation is in the uise o unusual soonds an instruments - bein mair unorthodox an questionin o muisical conventions. ↑ 1.0 1.1 1.2 1.3 "Progressive Metal". Allmusic. Archived from the original on November 24, 2011. ↑ Neate, Wilson. "High Tide - High Tide". Allmusic. Retrieved 2011-10-10. ↑ Neate, Wilson (1969-07-08). "Sea Shanties - High Tide". Allmusic. Retrieved 2011-10-10. ↑ Buckley 2003, p. 749, "Rush were throwing off shackles of prog-rock and heavy metal,"
↑ Thomas, Stephen. "Uriah Heep". Allmusic. Retrieved 2011-10-10. ↑ Rivadavia, Eduardo (2006-12-21). "Lucifer's Friend". Allmusic. Retrieved 2011-10-10. ↑ Palm, Matthew J. (November 8, 2006). "Jared Leto has a 30 Seconds love affair with fans". Orlando Sentinel. Tribune Company. Retrieved October 28, 2011. ↑ O'Brien, Jon. "30 Seconds to Mars". Allmusic. Rovi Corporation. Retrieved October 28, 2011. ↑ "GIT Welcomes Paul Gilbert | Sep 22, 2006 | News & Events at Musicians Institute". Mi.edu. 2006-09-22. Retrieved 2011-10-10. This page wis last eeditit on 11 Mairch 2019, at 08:15.